This article is reprinted from leftvoice.org. — AUG. 5 — The National Convention of the Democratic Socialists of America is currently under way. An estimated 700 to 800 delegates representing 25,000 members nationwide are participating in the four-day event at the University of Illinois in Chicago. In the weeks preceding the convention, numerous resolutions were put forward by individual members and groups, some of which were circulated throughout the organization to be presented for discussion and vote at the convention. On Saturday (Day 3), the discussion centered on amendments to the DSA’s constitution as well as the organization’s national priorities. The delegates voted to sever relations with the Socialist International, a conglomeration of parties that have embraced and in some cases implemented neoliberal policies around the world (ie., the German SPD, Hollande’s Socialist Party in France, Peña Nieto’s PRI in Mexico, the Indian Congress Party, and the Greek PASOK). 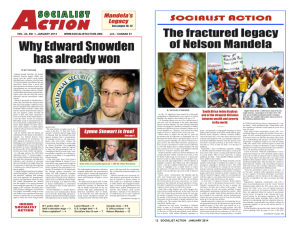 The DSA has been affiliated with the Socialist International since its founding in 1982. Saturday’s vote to leave the international marks a historic shift, signaling the political leanings of the exponentially growing new membership. At the same time, some members are putting forward proposals for building “stronger relationships with new left parties and movements” outside of the SI, “from Podemos (Spain) to PSOL (Brasil) to Momentum in Britain” (from DSA Momentum Platform). “Israel has engaged in a program of rapacious colonization (‘settlements’) of the Occupied Palestinian Territories…Israeli settlers in the West Bank are given the rights of Israeli citizenship, subject to civilian law, and are permitted to drive on roads barred to Palestinians…Palestinians in the West Bank are not Israeli citizens, are subjected to military law, including being tried in military courts with a 99% conviction rate, are forced to drive on different roads…[T]here are today at least 50 laws that discriminate against Palestinians with Israeli citizenship. The decision immediately rippled through social media and was lauded by many inside and outside the organization. “We should recognize that the Democratic Party is not our party, even if we sometimes run or support candidates within it. We have, therefore, no interest in its internal battles, such as the fight between Keith Ellison and Tom Perez. We should refrain from endorsing or supporting Democrats engaged in political struggles within the Democratic Party. Taking part in such internal Democratic Party fights only disorients our members, leading them to believe that the Democratic Party can be a vehicle for the aspirations of working people. The proposal did not advance a clear break with the Democratic Party; it was milder in content, but was still struck down at the convention. Although the DSA’s electoral strategy and the question of full independence from the Democratic Party has proven difficult to resolve, the events taking place at the DSA convention signal auspicious changes brought on by the growing new members and influx of youth. August 7, 2017 in Marxist Politics and Philosophy. Socialist Action National Convention: Build the Party!